The chapel at Haddon was built early on in the estate's history and some of the original 12th-century Norman structure still remains. 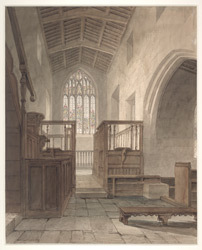 The window seen in this watercolour is a fine example of 15th-century stain-glass artistry. At the time that Buckler visited the Hall it had been empty for nearly 150 years. When the ninth Duke of Rutland reclaimed his ancestral home in the 1920s, he set about returning the house and grounds to its former medieval opulence. Work carried out over this time revealed a series of beautiful frescoes on the chapel walls.